Whether a play turned was a base hit or an error is an important decision, but 1983 Nashua Angel Steve Liddle knew that one decision wasn't that important given everything else in the game, according to The Nashua Telegraph. "Guys will make it to the big leagues on talent," Liddle said, according to The Telegraph, "not the scoring position on one play." Liddle never did make it to the big leagues on his playing talent. His coaching talent, though, got him there for more than a decade. Liddle first made the majors with the Twins in 2002 as a bench coach and he stayed with the club for 11 seasons, ending as the team's third base coach in 2012. Liddle's career in baseball began in 1981, signed by the Angels as an undrafted free agent out of Lipscomb University in Nashville. Liddle played his first season between rookie Idaho Falls and single-A Redwood. He made AA Holyoke in 1982, then AAA Edmonton in 1984. At Edmonton in 1984, Liddle hit .262, with six home runs and 51 RBI. He returned to Edmonton for 1985, but only got into 25 games. 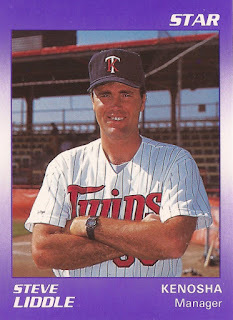 Liddle moved to the Twins system for 1987. He played that year at AA Orlando and the next at AAA Portland, rounding out his playing career and ending it short of the majors. Soon after, Liddle started his coaching and managerial career. He took over single-A Kenosha as manager in 1989, returning there for 1990. For 1991, Liddle took over high-A Visalia, staying there for 1992. He also watched over young Twins prospect Marty Cordova. In July 1992 Liddle assessed the future major leaguer's early minors struggles. "He possesses a major league tool that you can't teach, and that's bat speed," Liddle said, according to The Los Angeles Times. "But he never came to spring training in baseball shape. It's a year-round job, and it took two years for Marty to realize that." Liddle managed at high-A Fort Myers in 1993 and 1994, then served as hitting coach at AAA Salt Lake in 1995. In 1999, he became Twins' minor league field coordinator. Then, in 2002, he became bench coach in Minnesota. Liddle spent a total of nine seasons as Twins' bench coach. Then, in 2011, he became the Twins' third base coach. That was a job he had performed in the minors, when he was managing. "You have to make split-second decisions based on a lot of information," Liddle told MinnPost.com of his role that April. "I can't be a high-risk guy, because I've got to play the percentages." Liddle continued with the Twins through 2012. That August, he explained to LipscombSports.com his approach to players. "If you want respect, you have to give respect," Liddle told the site for his alma mater. "It is a two-way street. I give respect to the players and they respect me, not because of my position, but because of how I try to treat them."